¤ Viscosity compatible for FRP/SMC/DMC/BMC molding materials. Croda Pigment Pastes are high quality pigment pastes, offer users a wide range of distinct colour shades, specially formulated to impart weather ability and colour fastness. 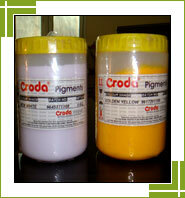 All Croda pigment pastes are based on stable, lightfast pigments and non reactive media. The colour pastes are made using a specifically formulated, monomer-free polyester resin as the medium. This resin used is compatible with almost all known polyester resins and gelcoats. 50gms, 100gms, 250gms, 1kg, 25kgs, 50kgs. Copyright © 2008-2009 Croda Pigment Pastes, All Rights Reserved.